Stitch Sampler Alphabet – Look for It! I’m Sooooo Excited to tell you this! Guess what’s finally showing up here on Needle ‘n Thread – in just a couple days? It’s been in the works longer than the Secret Garden Hummingbirds, longer than the Hungarian Redwork Runner… and finally, finally, it’s finished and ready to share with you! 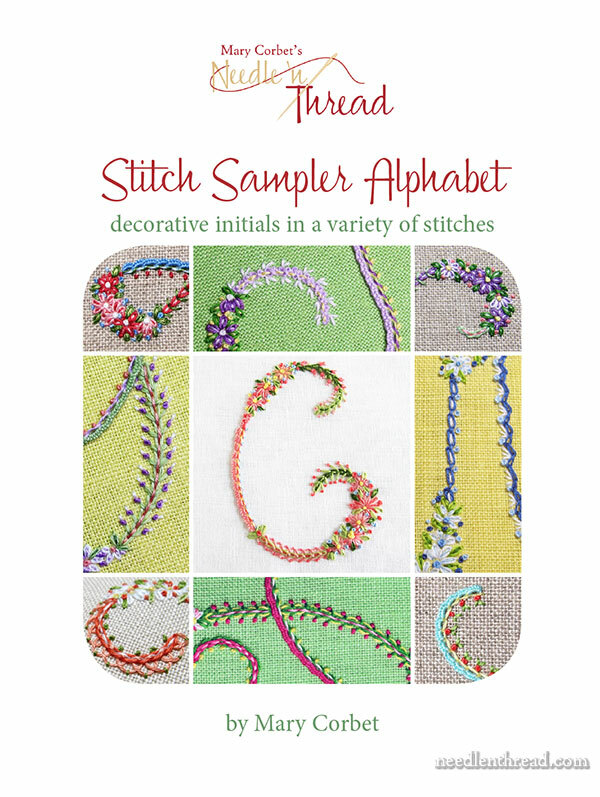 It’s the Stitch Sampler Alphabet, and today, I’d like to tell you a little bit about what you can expect with this new offering from Needle ‘n Thread. The project started a couple summers ago, when I thought it would be fun to stitch each letter of the alphabet, using a variety of stitches, combinations, and composites. Originally, it was a stitching game, a challenge to build an alphabet that relies on fairly simple stitches that can easily be made ornate by working up different composites and combinations. Stitch Sampler Alphabet features 18 basic stitches that are combined in over 65 different ways – and that beg for even further interpretation! Once you start playing with the stitches, seeing how they can be combined and further embellished, you’ll find out that the possibilities for embroidering decorative initials (or lines, borders and more, for any surface embroidery projects) are almost limitless! The alphabet is presented with stitching instructions for one letter that we work through together step-by-step. This is followed by each stitched letter sample, with a materials list (including fabric and threads lists) and a stitch layout guide. Close up photos show the various section of each letter and are accompanied by an explanation of the stitches and combinations used in each section. The letter samples, materials, and stitch layout guides are followed by a thorough stitch dictionary, with step-by-step photos of all the stitching techniques used in the alphabet. Full-sized line drawings for the all the letters are included, along with a resource list for all the supplies used in the samples. 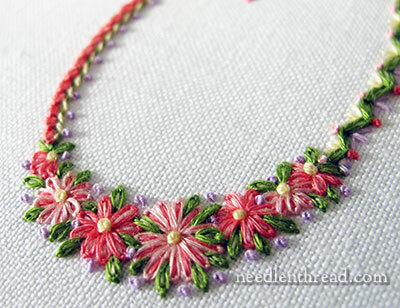 Throughout, you’ll find pertinent stitch tips that will come in handy as you work through your own projects and that will give you ideas for embroidering letters that are uniquely your own. The alphabet offers lots of room for stitching your own unique letters. You can apply the techniques to different styles of lettering; you can mix up the stitch combinations, choosing those that you particularly like; you can experiment with threads and color. 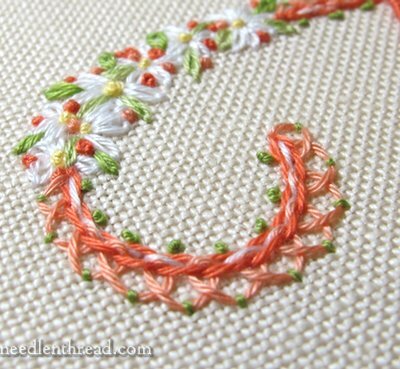 The techniques used in Stitch Sampler Alphabet are not restricted to embroidering decorative initials – you can use the combinations on your own embroidery projects, whether you’re working a sampler, a crazy quilt square, a crewel project, or any kind of surface embroidery project that could benefit from some decorative lines. Stitch Sampler Alphabet will be available as an e-book in PDF format, which means that you can open it and use it on any device that reads a PDF, from your desktop computer, to your iPad or other tablet, to your Kindle or your Nook. You can also print the e-book, or, to save on paper and ink, just print the pages you need. For example, if you’re embroidering a C, you might just print the pages pertinent to the C – the design, the stitch layout guide, and the stitch instructions. Because it’s made to be both printed and viewed on a screen, the e-book offers the advantage of allowing the reader to zoom in on the high resolution photos and see all the stitch details clearly and larger than life. The PDF is interactive, with a clickable Table of Contents so that you can easily jump right to the section you want to view. When stitches are mentioned throughout the book, they’re linked directly to their instructions in the stitch dictionary. And you can view the PDF in thumbnail view, too, which makes navigation quick and easy. The book is 120 pages long, in full color, with 26 letter patterns and over 525 photos. Stitch Sampler Alphabet is available now, for download, in my shop here on Needle ‘n Thread. Ooh, roll on Monday! Here in Oz I’ll have to wait until Tuesday to buy it while your calendar catches up. I probably be using it for your wonderfully inventive ways of combining stitches. Ooooh! I’m so excited it’s ready! I am totally doing a little happy dance right now 😀 I know what I’m getting for my birthday. Woo hoo! All of your hard work definitely shows, I am really looking forward to this book! Hooray!! I have been anticipating this forever and can hardly wait to finally view it on Monday. I have put off several projects where I would like to add a monogram or just tackle the complete alphabet as a sampler. Thank you for your wonderful website. Congratulations! I can’t wait to get this. Your work is brilliant and your instructions on your blog are wonderful, so to have all this in a book is going to be perfect! I know it will be my go-to book for years to come. Looking forward to this! I second. Your thoughts!!! My first project ! Congratulations! How satisfying it must be to wrap up such a monumental project. I’ve followed the progress of this project for some time now, and I’m willing to bet the finished book will be worth the wait! Oh Mary how wonderful! I’ve been waiting and watching ever since I first saw some of the wonderful designs you’ve developed on Pinterest. Btw, Pinterest is how I found you too! SO excited about your book coming out!!!! I’ll be here Monday ready to order. Congratulations, Mary!!!! Congratulations!! I can’t wait for the release. Such a work of art, and a labor of love. Oh I can’t wait! I have been waiting for this ever since you first decided to do it. It looks beautiful! Congratulations Mary, I have watched with great interest and really looking forward to seeing your final presentation. Congratulations! Look forward to ordering it! So looking forward to this ! Mary, I’m soooo excited. I will be buying your book on Monday!! Congratulations!!! Congratulations! What a lot of hard work, but it must be so rewarding for you. I can’t wait to see it because I love your work! This looks amazing. Just recently found your blog. It’s wonderful. I love that beautiful alphabet and I love discounts. I am waiting!!!!! Yay! Now I’m happy! Just the project I’ve been itching to get at! :). Thanks for all your hard work as I know the ebook is going to be fabulous! What great news! I know how long you have been working on this, and it is wonderful to hear about a successful completion! Now, when are you going to hem the Hungarian redwork runner? Hmm? Ahhhhhh, Josh – if only I were an octopus! But good things come to those who wait – so it will eventually show up here, finished, I promise! I’m so excited! I hate the wait but I know it’s worth it based on the other books of yours! Thanks so much! Hooray!! I have been anticipating this forever and can hardly wait to finally view it on Monday. I have put off several projects that I would like to add a monogram to or just tackle the complete alphabet as a sampler. Thank you for your wonderful website. Fabulous, Mary. Good on you. Roll on Monday! Whoo Hoo — what a great book this will be. Hello, Florence! The e-book is in English, but yes, the instructional parts are all step-by-step photos, so you should definitely be able to follow it! Merci de votre réponse, j’ai toujours peur de passer à côté “du mot” qui bien sûr me ferait broder comme une déesse…Comme vous. I can hardly wait to see the new Ebook and to have it! I am still so new to the needling world that I do best when I have explicit instructions and explicit design, so for me it seems you have the perfect approach. Wonderful! !I can hardly wait–I’m not so much into stitching letters but see the book as a great source of stitch, color, and thread ideas for other projects. Congratulations on finishing. See you on Monday! Hi, JoyceAnne – yes, that’s precisely a good way to see it! The stitch combos can all be used on plenty of other projects, besides just lettering projects! Yea! I am so excited! Mary – I am really looking forward to this alphabet!!!! I sincerely hope you are going to charge big time for all of your work in putting this together and making it happen. You deserve it. I for one will buy it from you, no matter what the price! CONGRATULATION, Mary!!! I have followed your blog for years (gasp, is that possible? ), have benefited more than I can say by your easy to follow “stitch guidance and design possibilities”, and your upbeat view on all things. This is your next logical step, and I can’t wait to line up to purchase this e-book! BRAVA!!! Yea. Thank you for all you do. Hi, Bobbie! Thanks so much – yes, it took a long time to get it out, and it will be a relief, come Monday, to finally have it available! What a huge labour of love. So excited about this, as although I mainly make garments, I have always loved working on monograms. Thank you so much for putting together this amazing resource for us all. The launch date is as I leave for a Birthday and then Wedding Anniversary celebration…….I will scoot onto the computer as soon as I return home. Hi, Marysia! Monday is an anniversary celebration for my family, too – my parents will be married 58 years on Monday! Been waiting almost patiently. Come on Monday! Wow! I’m so excited about this I may spontaneously combust before Monday! Thank-you for all your hard work. No spontaneous combustion allowed, Juli! 🙂 LOL. That’s funny! Congratulations!! Sounds marvelous…so much to try. That’s wonderful! Congratulations on this achievement! Looking forward to it! What great news to share with my morning cup of coffee! This is going to be treasure to add to my tool chest! I have read and re-read your message and didn’t see the cost listed. So excited to see the alphabet. Very good news. Oh Mary, I am so very excited, and cannot wait. I have a question. May I sent the PDF to a friend who owns a copy shop to print it for me? Will he have any problems, and will this be OK with you? Hi, Terry – You can certainly have it printed at a copy shop, as long as it’s for personal use only. No problem at all! You won’t be able to email it, but you can put it on a stick (USB drive, or even a CD or whatever) and deliver it that way. This is so exciting. Looking forward to the 27th! I have been looking forward to seeing the sampler alphabet. You’re a good teacher, so I know it will be great! [Kermit Flail} WHHHHEEEEEEE!!!! Can’t wait! LOL! I LOVE the Kermit Flail! I pictured that perfectly! Glad you’re excited, Maureen! You have been dangling this treat over us for so long and I for one, am excited to see the final complete book. It will be as wild as Christmas and Birthday all rolled into one. Yippee!!! Yea! I’ve been one of the ones eagerly waiting! Heading over to my Pinterest now to decide what project I want to work on first! I will be travelling with Da and won’t have a chance to see or purchase until late Monday, but SO excited!! 🙂 I guess it would be, in a sense, a good problem to have, right? But I think we’ll be ok – the cart is an app, separately hosted, so I think we’re safe! Have fun in your travels! AT LAST, AT LAST!! I have my 3-ring binder, my page protectors, and a full ream of paper, I am ready! Congratulations, Mary. Finishing something you have been working on for almost 2 years … Wonderful. Gee Mary, you are NOT an octopus? Anyways, congratulations! It has been a privilege and a joy to see how you developed these wonderful stitching combinations, it is truly an inspiration. BTW, what about the hummingbird feather? Oh, the hummingbirds are coming, too. I did fall a little bit behind, despite my best intentions and I have a few more feathers on the tail to finish still – but almost there. Yep, no matter how hard I try to sprout those extra arms, it just doesn’t happen! OMGOSH! I am salivating, cannot wait! Looking forward to it there isn’t a better gift I can give someone than a gift with an embroidered initial on it, and best of all I get to play with stitches and threads! It’s a gift that gives and receives. Thank you for your hard work. I’ve been waiting for this to come out. Can’t wait to order it. Wonderful! I will get this for my grandchild. I’ve been waiting for sooooooooo llllloooonnngg for this can’t wait I’m so excited to see this long awaited alphabet e-book so come on Monday. Congratulations on finishing the e-book I know you have been working on this for so long that it great news that it’s finally completed and waiting for us to own a copy. I can’t wait to browse through and see your stitch combinations and thread colours, fabric choices and all the wonderful monograms. Thanks so much for sharing this great news and for the photos above looking forward to this. Congratulations, I am so excited.I visit you often here to enhance my stitches.I will be watching closely so O don’t miss out on the Release of the ebook .Thank you for putting it together . I can not wait! I have been waiting and watching – the sneak peeks have been amazing! This will make Monday so much more exciting! I can’t wait to download it. Well done for your perseverance Mary and thank you in anticipation! I can’t wait! I’ve been in the “anxiously awaiting” crowd and will be one of the first to purchase this fantastic ebook. Thank you so much for all the hard work and persistence!!! Mary, I am trying not to drool all over the keyboard as I wait for this book!!!. I am just starting a crazy quilt project and I really need the “A”. Plus I have a newly minted granddaughter as of 6 days ago. She really, really needs an “M” for Matilda. Then there is always “S” of course. Can’t wait!!! Dear Mary, I´m sooooo happy for you… and me!!! Congratulations for another concreted project!! I´m waiting for Monday to see the e-book. Could you tell me how paid for it If I don´t have Paypal? I have credit card, is that an available option? Hello, Paula! Thanks for your note. You don’t need to have a Paypal account – you can pay via credit card through the Paypal app, without creating an account. The option to pay with a credit card without a paypal account is given when you check out. It still goes through paypal, but without setting up an account. Congratulations for finishing this amazing project! YAY!!!!! I am so happy to hear this! This made my day, I would skip over any mentions of the book before because I didn’t want to get my hopes up… But now YAY!!!!! 🙂 Wow – I think you might even be more excited than I am, Ren! Congratulations!!! I’m looking forward to it! Mary… I don’t think I will sleep a wink on Sunday night because my mind will be planning all sorts of stitching projects to do once I buy your book! Congrats on the book’s completion…YEAHHHHHHHHH!!!! Congratulation!!!! Looking forward to it’s release. Your work is always so beautiful. So, so excited to print out this new book Mary. I will have it spiral bound so that I can look through the entire book at my leisure, thanks for all your hard work. Roll on Monday! Can’t wait! You do such beautiful work and easy-to-follow instructions. Thanks! Hi, Dorian – it’s a downloadable ebook, so once you have it on your computer, you can use it indefinitely! Count me in! I prefer print because I read a lovely book like this the same as if I’m reading a novel but it would be so nice to be able to essentially carry it with me all the time! This looks to be so incredible, can hardly wait! Only question is: what is the cost of it? Hi, Kathy – thanks for your comment! Well, as for price, that’ll be announced on Monday. The introductory special will be less than $20, that I know. I just have some figures to work up over the weekend to solidify it. Hi, Susan! Thanks for your comment. This one will only be available as an ebook, I’m afraid! Mary, your timing is perfection! I’m working on a table runner that was used at my newest granddaughter’s adoption party. It was signed by all the family and guests (with wonderful drawings by all the kids and young cousins!) I’ve learned much in the process from Needle ‘n Thread.I can’t wait to fancy up some of the alphabet with your stitch “recipes!” Thank you for being an inspiration and a go-to resource! This is like being a child waiting for Christmas!!! So glad soon available!!! Yes !!! I’m SO excited!! I am one of those waiting not-always-so-patiently folks! Can’t wait to see the book and I already want one!!! Thanks Mary! You’re great!! Looking forward to this book .will you be publishing it as a “real book” sometime or just available on the computer . As much as I enjoy the computer there is nothing quite like having a book in your hands. Congratulations on completing your project. Hi, Diane – this one will only be available as an ebook, I’m afraid! I can hardly wait. This is wonderful. I wish it was ready today! I have only recently become obsessed with embroidery and have no skills to speak of yet. I have a very important family wedding coming up and, since I am on a small fixed income, I was feeling quite sad that I would have no really special gift for them. Now, I feel quite confident that, with your help, I will be able to give them a really beautiful and personal gift that they will have for many years to come. Many thanks to you! Let me join everyone else in expressing my excitement! Yippee!! You are making a lot of stitchers very happy! Can’t wait for Monday! Thank you, thank you, Mary! See you Monday, for sure. I am so excited about your ebook. I love the gorgeous initials, and the one you showed in your post “D”, is my sister’s initial. Do you suppose she will be getting a present? Thank you for doing all this work, so that the rest of us can play. Whew! What an accomplishment to finish and offer your wonderful alphabet! I am an old-fashioned girl (am I the only one?) who still prefers paper/printed books. Any chance that it might be published and purchased in paper book form? Hi, Victoria – thanks for your comment. This one will only be available as an ebook, I’m afraid! This is Exciting News! Congratulations! You’ve worked so hard on this book — 525 photos?!?!! Wow! I have two of your e-books, and your books are as divine as your stitches! I can’t wait. Congratulations!! I would love to do my happy dance for you & us but the emoticon people haven’t made a dancing snoopy or bunny yet so just know happy I am. I didn’t “see” the previous 89 comments… So, I get it – it’s in e-book format only. Sigh. 🙂 That’s ok, Victoria – I would like to go the real print route some day, but right now, it’s just doesn’t seem to be in the stars! Yayyyyy……looking forward to the release. I am in the process of making a pillow top and decided to embroider Sweet Dreams in the middle of it. Originally planned on just outlining it with stem stitch but I’ll be pouring over the e-book for more inspiration. Alphabets are always fantastic to have on hand to personalize gifts, home decor and so much more. I can’t wait to see this book. I’ve been looking at glimpses of your letters for some time now and trying to figure them out, it’ll be great to have so many photos and real instruction. Love your work! Embroidery has totally captured my attention (originally as a hand relief from knitting, but then…), and your blog has taught me everything!! There is NO HAND embroidery in Manhattan, New York City (it’s needlepoint and quilt, but you can purchase books on embroidery) maybe one or two shops in Brooklyn. I can perform the stitches, but without flourish. I’ve thought about a sampler and this will help me understand how to group stitches together for more effect. Then I can share with my neighbors in the park during nice weather. I live in the Bronx, ironically surrounded by women from around the world who perform beautiful handwork––Latin America, Eastern Europe, India, Russia and The Middle East. Despite the language differences, we communicate through stitching, and have a nice time together. Congratulations. I am a recent follower of yours and am “blown away” with your work. You are a real inspiration to those of us who love embroidery. I’m sure that even those like myself who are at an age where fading dexterity and eyesight join to make things difficult can see through your wonderful photography and descriptions the beautiful work you are doing. Keep it up. I love following your creativity. Thanks, Joan! I’m glad you enjoy Needle ‘n Thread! I am as excited as the next guy!!! Congratulations Mary! Well done you. Thank you very much for all your hard work. I always view you as my not so private sweatshop :). There are just not enough hours in the day or years of my life to extensively experiment and try absolutely everything. Still no extra arms for me either, you know! Will you celebrate this mile stone achievement? More threads or fabric for your stash perhaps? Yay! I can’t wait! You have put SO much work into this! Congratulations on finishing. I’m looking forward to using it. I’m looking forward to it! Love your blog and work. Hi Mary ~ Looks like a lot of us are excited about this book being released on Monday. At least with an e-book, you won’t run out of copies. Mrs. Corbet, you are a hand embroidery genius. Not joking! Have you ever considered publishing your e-books in book format? OMG!!! I’m so excited! Congratulations! I’m sure it will be just as superb as your website and all your other things. I’m in love with the lattice book. This is the best thing that’s happened to me since my divorce in 1984 – maybe even before that! I thinking about taking enough sleeping pills to get me through till Monday but I guess that won’t work, so I’ll just have to suffer through the next few days like everyone else. In the meantime, I need to make a trip to Office Depot for more printer ink – I sure don’t want to run out in the middle of printing this! I have a notebook for it – gosh, do I have enough plastic sheet protectors??? Gotta check that too. I can’t imagine just printing one letter …. Great news! This is a huge accomplishment! I’ve been patiently following your updates on this project and I’m thrilled that it’s almost ready. You have a great eye for combining stitches and I hope to get a better understanding of how to do that myself. Very intriguing, can’t wait to check it out! I am so happy to know you have finished after so many long months of hard work (and we were waiting for you !!). I live in France and I do embroidery each week with some groups of friends. I always encourage them to have a look on your site and I promised to tell them when your book will be available and help them (with a friend who was a teacher in english language) in there embroidery (because some of them don’t know english); they already take care to do and stitch with your tips and videos, and are so glad to learn with you ! Thank you so much for every thing you do for us ! whoot whoot! Exciting news Mary! I’ve been in hiding recovering from shoulder surgery, with months of treatment prior to that. I hope I can hold a needle and thread steady, soon! Can’t wait for this ebook. Mary, Wowee…I can hardly wait. I am looking forward to getting back into stitching with this! Well done Mary! Thank you for all the time and effort you have out into this project. Its going to be fantastic. WOW!, Can’t wait for this, love combining simple stitches to build new ones! I’ll have to wait till Tuesday morning on the bottom half of the world – very exciting, thank you! So excited! I love letters. These snapshots are beautiful!! So happy to learn this! Can’t wait. It looks wonderful, the peeks that we see. What are the actual sizes of the alphabets? I know we can reduce or enlarge whenever we print, but is there a basic size? I know you are super excited and will have something to check off your To do list. Can’t wait until Monday! Hi, Jackie – the letters are 3″ tall, so they’re not super big, but they’re not super small! How perfect for you to release this on my birthday?! I will be here with bells on, ready to snag it! Congratulations dear Mary – I am so, so proud of you, and I know I will love this book sight unseen – it’s a given! Bless you! I am so-o-o excited!! Can’t wait until Monday. Thank you, Mary, for sharing your creativity, your vast knowledge and skills, your wit, and your love of all things embroidery. We love and admire you! Yay! I can’t wait for Monday. I seldom look forward to a Mondays! Oh! I, too, simply can’t wait! I just know it will be a runaway New York Times Best Seller! Congratulations! I know this has been a long time coming. I am very excited to see your new e-book. I have enjoyed the snippets you have shared and love the creativity you have offered in the letters. I can hardly wait for Monday to get here. SO looking forward to this!!!!!!!! You must be so proud congratulations! I am looking forward to purchasing my copy. I am still working on stump work. Bye the way do you know what the authors are referring to as paper covered wire. Is it floral wire? Hi, Sheridan – Thamks! Yes, paper covered wire is florist wire. It’s also used in cake decorating, so you can find it in that section of hobby shops, too…. Wooohoooo I can’t wait! My grand daughters and I will be stitching these up! Thank you Thank you Thank you! Congratulations! That’s a huge project. Thank you for putting together this e-book for us. I look forward to the release! Please can you give me an answer. Looks lovely – looking forward to Monday! Have some projects already in mind! Oh Mary, thank heavens! I have been hoping for just such a book from you. I can’t wait. Woo hoo! I’m sure you’re so happy that it’s finally done! Congratulations Mary! I’m so pleased you’re almost ready to go. Congratulations Mary! Such a wonderful accomplishment and now you get to share the love. What’s it like to know you’re actually creating happiness with what you do, for now and future generations? I’d suggest that you look into that hard copy book deal a little more, I’m pretty sure it would be successful too, and likely to expand your followers base. Alphabets appeal to everyone. I’m looking forward to your eBook. And hey, you owe yourself a celebration, so make it happen girl! Woot!!! So glad you’re ready to share this with us. I am so excited. I’ve been wanting your beautiful alphabet since I saw the first letter you published. Thank you Thank you. See you tomorrow on line. So happy for you – so happy for me! Have been waiting for this day (Monday) since you first announced it was to be available for purchase. Thank you in advance for all your hard work. I’m sure you have more hours in this than purchase price allows. All your fans – me included, are so very appreciative for all you do for the hand embroidery world… this is a true breath of spring! Thank you again for all you do for us! Thanks, Barbara! I’m glad you’re looking forward to it! I am so excited I cannot wait for the ebook. This looks so exciting ! I am a beginner in surface embroidery. Could this be done by a beginner who is still learning terminology, the thread world, etc. I have been working on a doodle stitch piece on 100% merino wool felt. If I tackle this project would it be more difficult to do on the wool vs. linen ? I love your newsletters and whenever I am learning a new stitch from another source I find myself always going back to your tutorials because they are clear and visually superb. Hi, Patti – You sure can stitch the letters on felt. You just need a good way to draw the patterns on. I’ve perpetually had problems transferring specific patterns to felt, but I do know that the Sulky iron-on transfer pens work pretty well on felt. The difficulty with them is that they produce a somewhat heavy line. But if you’ve already figured out how to draw on felt, then you shouldn’t have any problems! Oooh I am refreshing all morning – I hate being hours ahead! Thank you so much Mary! I was able to download it successfully just a few seconds ago!!! Yippiiii!! Can’t wait to have a look!! Thanks, Samia! I hope you enjoy it! I am so, so, so excited!!! Thank you, Mary!!! Oh, and Congrats!!! I have purchased your Alphabet book. It will be very useful for me. I am amazed at how many stitches you have using the chain stitch. Also, I love hearing from you everyday and get ideas for embroidery, websites, books and places to shop. Hi, Sylvia! Thanks a bunch! Yes, the chain stitch is super-versatile – there’s so much you can do with it! Thank you. I did receive your email and files. Thank you so much. The file did open and with help I was able to save it properly. Thank you once again and congratulations on a job well done. I’m disappointed that this information is not available in a printed hard copy. It would cost me way more than a book to print it from my computer and I would still have separate pages with the possibility of getting scattered all over. I also find it next to impossible to stitch with the computer sitting in my lap. Please let us non computer people know when you have a Hard copy book available for purchase. Previous Previous post: You Need More Thread! Next Next post: Have You Ever Embroidered your Handwriting?